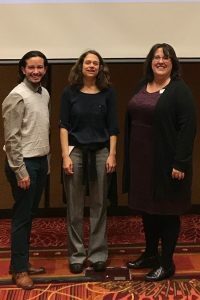 Fall has been a busy semester for individuals providing gender-affirming communication services (GACS) at the Eckelmann-Taylor Speech and Hearing Clinic within the Department of Communication Sciences and Disorders (CSD). Lisa Vinney, CSD assistant professor; Tricia Larkin, CSD clinical educator; and Jordee Yanez, School of Social Work (SWK) graduate student and CSD graduate assistant, have worked within the Bloomington-Normal community to build awareness for this specific service. They also represented an initiative funded by the College of Arts and Sciences for interdisciplinary efforts between CSD and SWK. Interdisciplinary team members anticipate further outreach to professionals, referral sources, and potential clients in the communities around Illinois State University. Contact the Speech and Hearing Clinic if you are interested in learning more about this topic, the interdisciplinary grant, or gender-affirming communication services.